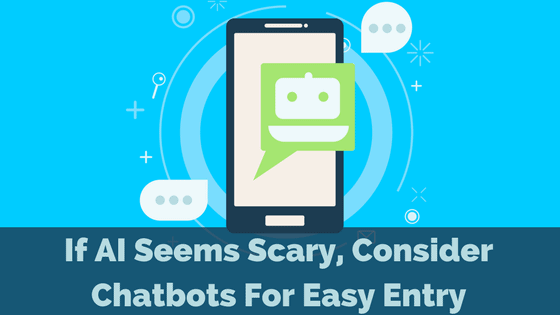 Chatbots are an easy entry into the world of artificial intelligence (AI). Although terms like “chatbots” and “artificial intelligence” seem overwhelming, I promise you they’re not. Chatbots can take Facebook Messenger, for instance, and open up a whole new world of customer service via pop-ups. Read on for a deep dive into what chatbots are, and how we’re currently using them to ease our clients into AI. First things first, I feel like many business owners hear “AI” and think of Will Smith in iRobot. While there are as many as six definitions for AI, the easiest to digest is probably from Encyclopedia Britannica. Marketers are looking to AI-powered solutions to help them improve the customer lifecycle. Secondly, there are endless ways intelligent teams have used AI. Now that we’ve had an AI overview, let’s get into chatbots. It’s no coincidence that chatbots are also known as “conversational agents” since their AI makeup has them mimicking humans for the purpose of conversation. Think about Siri and Alexa. Though your business doesn’t likely need something that robust, the technology is the same. AI-powered chatbots allow you to have real-time conversations with current and potential customers through AI. For example, my go-to makeup distributor, Sephora, uses chatbots like a champ. Sephora uses its Kik chatbot to ask questions, display emotions with emoji, and ask users to take quizzes. On top of that, they also use a Facebook Messenger chatbot which uses AI to convert customers and book in-store appointments. Think of the implications of something like this with Sephora. You would need an army of humans to have these interactions with thousands of customers day in and day out; it would be a logistical nightmare. 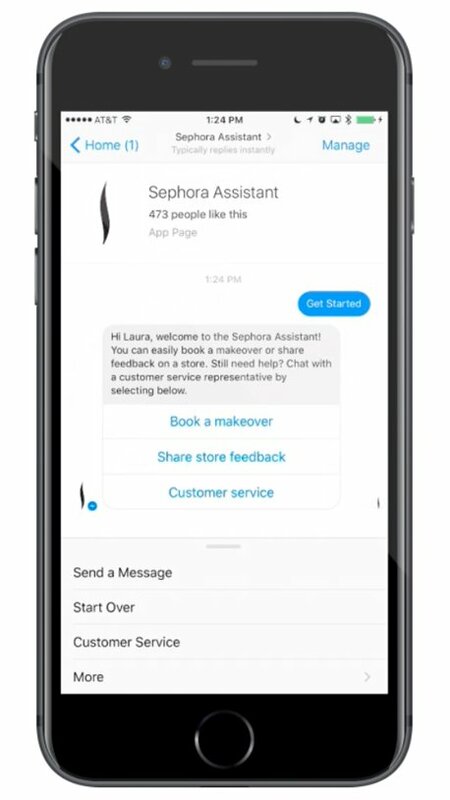 Using their Facebook chatbot, Sephora saw an 11% lift in appointment bookings and took five extra steps out of their booking process! If you’re still on the fence about marketing with chatbots, stay with me. Wizeline, a company that helps build intuitive AI, is a great place to read all about chatbots. Here are a few golden nuggets from their site. 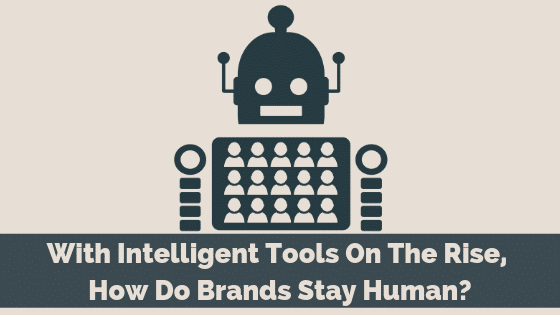 Trust me, chatbots and AI are altering the way marketers go to work. 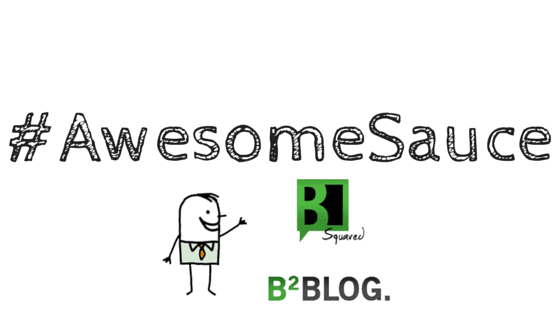 It’s no secret that we are stark raving fans of Sprout Social here at B Squared. 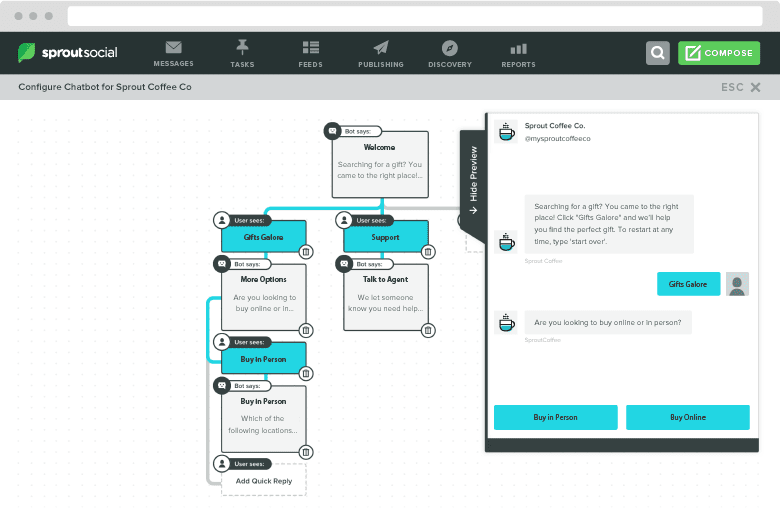 Using Sprout’s Conversation Map, we can easily visualize the conversation we want to have. Also, by introducing Quick Replies and Auto-Responses, we can guide current or potential clients down interactive paths depending on which buttons they engage with. Recently, we introduced chatbots to a staffing client since they have a high volume of applicants who reply to ads for job postings. And setting it up was super simple thanks to Sprout! We’re brainstorming ways we can bring this marketing technology to more of our clients and help them automate sales & marketing. Ready To Join The World Of AI? Lastly, if you’re interested in how we can help you use chatbots in your own business, book a (free!) conversation with me, Brooke, to brainstorm a few ideas. 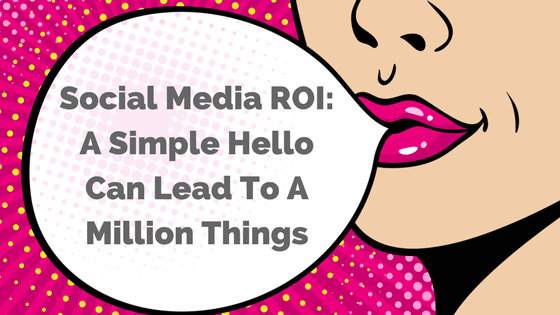 Knowing that 85% of customer service will be handled by bots in 2020 should be the fuel to light your chatbot fire! If you’re more DIY don’t want someone (or us!) 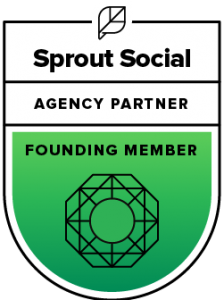 to manage your bots, or don’t have access to Sprout Social, don’t fret. And, if you’re currently using chatbots where you work, SPILL THE TEA! ? Let us know how chatbots are helping you in the comments section below.